Showing results for tags 'ninjago movie'. Ninjago Movie Master Wu Torso Symbol? I really love the new Ninjago Movie Sets,and two of my first Sets were the City Chase and Master Falls. They were Fun little Builds,but i always thought could do more with them. The first Set i remodelled was the City Chase,especially that Green Grocer Stall.I turned it into a Building with a Shop on the Ground Level and added a few more Details.The Building is only a few Studs deep because i wanted it to work like a Background.I tried my Best to incorporate some asian architectural Vibe,not really sure if i accomplished that,it`s up to you to decide. 20170825_171726 20170825_171739 20170825_171748 20170825_171759 20170825_171816 The second Set i modified was the "Master Falls" Set with the hanging Rope Bridge.The left Side was a tad bit boring and bland for my Taste and so i started adding a few Bricks.....until it turned out into a creepy looking Entrance to a Cave or something (just think of all the Skull shaped Entries to secret Caves and Hideouts you have seen in TV). 20170825_172332 20170825_172340 Oh,i also found a nice Place for the Polybag Dragon... 20170825_172352 20170825_172404 20170825_172411 20170825_172425 20170825_172458 Hope you like my Modifications,Comments are always welcome. (MOC) Set 70612 alternate build Lloyd's Green Dragon Armor Suit. Hey all! Welcome to my pictorial review of set 70613 Garma Mecha Man. It retails for $59.99 in the US and comes with 747 parts and 4 minifigures. This set will be evaluated on a scale from 0 - 100: Figure Desirability/Quality, Main Build Design, and Main Build Aesthetics. On a side note - I'm out traveling and couldn't resist getting my hands on a Ninjago Movie set, so lightning is not top notch, but hopefully the photos can get the point across. And now, without further ado, let's meet the Mecha Man. Let's start off with the figures. For $59.99, you only get four figures, which is disappointing given the high amounts of figures in smaller $20-$30 sets. Another henchman or ninja (or both) would have been appreciated to add value to the set, but for now, let's take a look at what we get. Let's start off with the titular villain, Lord Garmadon. He sports a new armor element that extends his torso and gives him two extra arms. While similar to the element used widely in the Stone Army range of sets in 2013, it has a flat front and more detailed printing, unlike the previous variant. 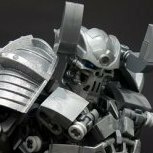 Garmadon also includes a new samurai-style helmet mold, which is fitting for the villain and, in my opinion, much more intimidating than his simple bone helmet of 2011-2012. From the back, it does come across as comically large, although I assume that was done on purpose. Unfortunately, there is no back printing on the upper torso, something which would have been excusable up until this point, where LEGO has proved their ability to print on the backs of such longer torsos with Garmadon's Jungle, "Dad," and Pajama variants. However, I suspect this wasn't printed because this figure normally comes with a large, regal cape, something which is inexplicably and very unfortunately absent from this set. With the plus-size torso removed, Garmadon's chest printing is very similar to his 2011-2012 TV show variant, with his simple, white muscular lines. With his old man out of the way, the spotlight shifts to Lloyd, the Green Ninja. Lloyd is decked out in a spiffy new outfit with reflective gold highlights and layered texturing around his suit - look closely and his suit is patterned with diamond marks, adding another layer to the print that shines in certain lighting. The back of his torso is adorned with the classic Sensei Wu logo from way back in 2011, with a few minor stylistic changes to curvature and thickness of lines. Again, the diamond pattern repeats onto the back and he wears a simple green belt around his waist. Lloyd's mask comes as two separate elements that weave together seamlessly, much like Darth Vader's newer mask introduced last year. The back of the new hood dips back dramatically to allow the tied "knot" of the upper mask to fit, revealing almost all of his alternate face. Lloyd also comes with a new sword mold with the 2016 tassle element attached to the end. The new sword is extremely sleek and is a refreshing update to the original katana we've been seeing variants of since 1998. However, with the tassle removed, the end of the handle does feel a bit out of place, continuing past the stopper. An interesting note is that every new element in the set is copyrighted to 2015, which shows just how long this movie and its sets have been in production. And now, we move onto Garmadon's lackey: Great White. The shark part of the getup is unfortunately attached to the armor and battery indicator as a single mold, making head movement impossible and decreasing the reusability of the parts. However, the mold is an extremely nice element for its limited use, sporting two color tones for the shark head, white teeth, black eyes, and dark silver armor, bring the color count in this single mold up to 6, counting the red batter indicator. On the back of Great White sits the traditional LEGO airtanks we've come to know and love, which was a bit of a surprise to me - I figured it would be part of the armor. Note that the back of the shark head curves upwards greatly to accommodate this element, meaning that a great section of back head and neck is exposed without the tanks. With the headgear removed we get a peek at his comical expression - if nothing else, these aquatic army troops give us really unique and fresh facial expressions. For those interested, with tanks removed, the back of the soldier is thankfully printed, with a skydiving clip and pockets. And now for the final figure - a civilian: While just a side character, this female civilian brings all new prints and a refreshing look to an "ordinary" city-goer. The feet are printed excellently with sandals, and the blue printing on the legs is consistent with the printing on the torso, which is a relief. She also sports the conical hat new to the Ninjago Movie and common throughout its several sets. Note the copyright 2015 on the backside. The back of the torso is extremely simple and almost plain, save for a few lines here and there. However, there really doesn't need to be anything here, so it's passable. But the figures aren't the reason you'd buy this set (or maybe they are, but regardless, let's meet the Mecha Man) Behold the Mecha Man! Compared to the poster, the set is extremely downsized, but this is to be expected with movie to set conversions. One very notable omission is the gargantuan staff the movie version wields, which is designed to match the new staff element Garmadon is wielding in the poster. This omission is particularly disappointing as there's nothing for the hand to do on the toy version, besides one small thing we will get to. In addition, the red eyes on the side of the hammerhead shark head, which appear very menacing in the movie, seem very comical in this version, as no attempt was made for eyebrows or elements to cover up the circular nature of the 1x1 plates. Thus, the eyes, combined with the slanting mouth, give the mech a comical and unthreatening gopher-like appearance, which is quite unfortunate. From the side, unique elements start to pop out, such as the back-mounted boot thrusters and the amusing shark tank in the back of the mech. However, this angle showcases some of the mech's weak spots as well, such as the gappy knee plating, disproportionate, chunky legs, and unsightly red and blue bits around the sides. LEGO's been doing a better job of making mechs more presentable from the back, and this is no different - in fact, the back side reveals one of my favorite and most quirky parts to the set - the fish/shark tank that houses the ammunition for the left arm cannon: sharks. Or, rather, blue fish, because sharks wouldn't work at this scale. The back also reveals some out of place yellow, red, and blue elements, especially on the back of the cannon, bottom legs, and head connection area. I'm all for including multicolored bits to make the build process easier (staring at a pile of black bricks and trying to find a specific one is never a fun or easy task), but not covering them up is really unfortunate. However, the fact that this is a common issue and not an aesthetic error unique to this set (Assault on Hoth's ion cannon particularly stands out as an infamous example), and because the issue has appeared in far more egregious areas in other sets, I'm willing to not be as harsh on this particular fault. Starting with the feet, you can see the extreme efforts LEGO put into making sure this set was stable - efforts that may have overcompensated way too much, resulting in pretty much no foot movement at all. Any attempt to pose it with more than one "click" to the leg makes the set extremely unstable, which is ironic, given the purpose of the extra parts. Even when rotated side to side, the feet are still extremely restricted - the photo above shows the extent to which I was able to turn them. I don't understand why such heavy precautions were made - the friction joints were made for this purpose, and the ball and socket is extremely stable. Moving up along the leg, we can see the slightly awkward way the legs are placed - luckily, this is covered mostly by the side flaps, so aesthetically it isn't too bad. Functionally, it still offers a wide range of motion, so it does work. Up to the mid torso there's a fine bit of piston greebling that is sadly immediately covered by the front flap, leaving on the gold elements poking out and seeming rather out of place. It's a shame the flap revealed a bit more of this construction, as most of it goes to waste when fully covered. The upper torso front plate folds down, along with the upper head, much like the original Ninjago mech: 9448 Samurai Mech. However, unlike its predecessor, the upper helmet is not attached with a click-hinge and thus doesn't have any friction whatsoever, causing it to flop around needlessly during play. Moving to the arm, we take a look at the shark shooter: Sadly, this is one of the worst-looking parts of the set. It's asymmetrical in all the wrong ways, with only one missile. I understand the need for this - a second missile would prematurely fire whenever the arm was moved, but the execution of it is far from sufficient, leaving a gap on the other side of the cannon. The four front studs on the cannon look similarly exposed and unfinished, which is disappointing given that two single elements could have solved this issue. The one good thing going for this arm is the hilarious shark ammo belt, a fine detail I've come to expect from the Ninjago Movie sets. The hand is also given something to hold - the human artifact laser pointer. While it's not as clever or well-designed as the Kragle, it does its purpose as a laser keychain - the only issue is that the mech is given no way to hold it in a good pose. It can't point it and aim it at targets, contrary to what the box art suggests, and just looks very awkward held in the fist of the mech. Moreover, it's useless as a minifigure scale weapon - the attachment point is secured by a freely-moving Technic pin, making it impossible to stay in one place and be held by a minifigure. I tried several times to get a good shot of Garmadon with the weapon and failed each time, which is really unfortunate given all the promotional shots of him wielding the weapon. Overall, for minifigures, I would rate the set 80/100 - the designs are great, but having only four minifigures and the omission of Garmadon's cape drags the value down. Plus, each figure is available in other, cheaper sets (including the CMF line), which is unfortunate. For main build design/functions, I'd give the set a 70/100 - it's a cut above most other Ninjago mechs, but is nowhere near as well-built as Kai's mech, for example, and has a limited array of functions - the firing arm and the cockpit exposure (which is so loose it barely works). Plus, poseability (or lack thereof) really dampers the score. For aesthetics, I'd rate the set an 85/100 - at certain angles, it's very menacing, and it towers over a standard minifigure. However, aspects like repeated exposure of randomly-colored red, yellow, and blue bricks scattered about and the pitifully goofy eyes drag the score down. On average, the set clocks in at a 80/100, or B. It's a solid set with nice detailing, but the lack of poseability and questionable functions make it not one of the best Ninjago Movie sets. I'd say to buy this only if you are an avid collector of Ninjago, love the character of Garmadon, or are impatient and want to get ahold of any Ninjago Movie set before official release. Otherwise, given other options, I'd hold off on this set in lieu of sets with much better value (70611 Nya's Water Strider - only $30!) or better visual and functional appeal (70615 Fire Mech, for only $10 more) Hope you enjoyed the review, and feel free to leave comments and feedback below!